It is amazing what you come home with after a Scottish Rock Garden Club Discussion Weekend. After the Saturday night dinner there is usually a plant auction and after some well oiled bidding Maggi was the proud purchaser of three bulbs of Lachenalia rubida. This weird and lurid plant resembles how many of us felt on the Sunday morning after that dinner. This is not my normal time for repotting our Rhodohypoxis (I usually do them in February) but I had one pot of a good white form that was getting congested and so I did it while I remembered. The corms produce small offsets on the end of stolons that rise up from the base of the corm which, if left, will become independent after a year or two. However if you break them off complete with stolon, they can be grown on and even though they may be tiny most will flower next year. 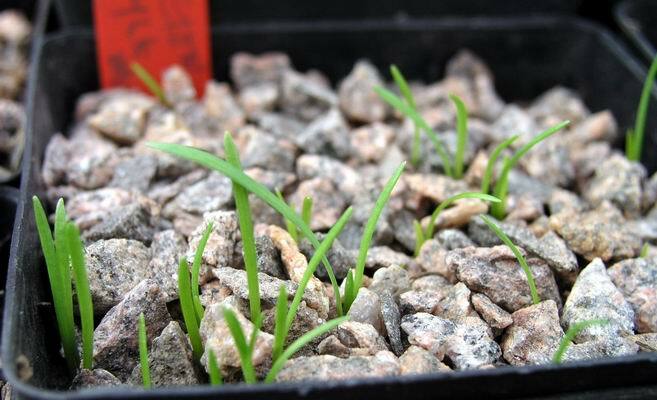 Still on a Southern Hemisphere theme we have a pot of Ipheion seedlings germinating in the glasshouse. I have mentioned before that we have not had a lot of success in germinating Ipheions when sown in pots but we do get self sown seedlings in the garden - this pot full proves that it is always worth persevering. I am often asked what you can do if your spring bulbs are coming through too early. 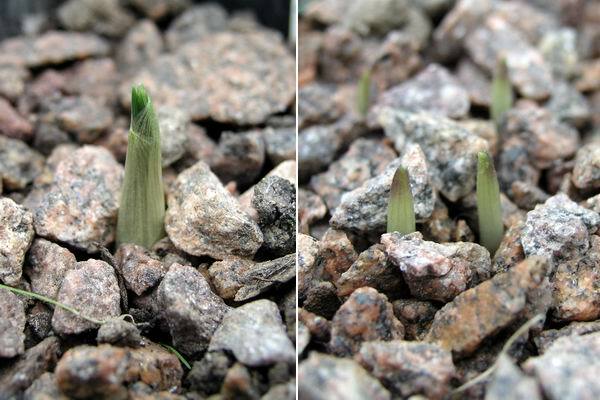 This is a spring Crocus and Tecophilaea cyanocrocus pushing through the gravel today and this is perfectly normal. The plants are doing the equivalent of queuing at the sales to get the best chance of a bargain. They will stay in this position until the weather and other triggers indicate that spring has come, and then they will rush into growth. Unfortunately our stop/start winters in Scotland often send out a false message but there is nothing practical that we can do to change this. 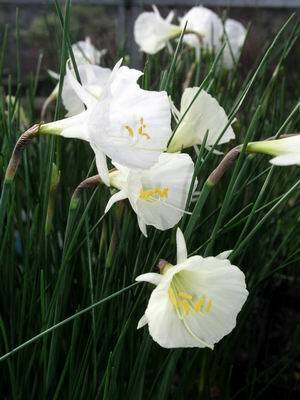 As we are heading out of the Crocus peak flowering time the narcissus flowers are getting going. The winter flowering Narcissus do not have the fantastic colour combinations that the crocus offer us but they do have a quiet charm, which, in the best forms, can be equally captivating. N. romieuxii mesatlanticus is one of the best of these small bulbs when it comes to flower power - it flowers freely every year without fail. When it comes to the taxonomy it becomes a bit muddied as no one is absolutely sure just where this lovely dwarf daffodil fits - most books place it in with N. romieuxii. 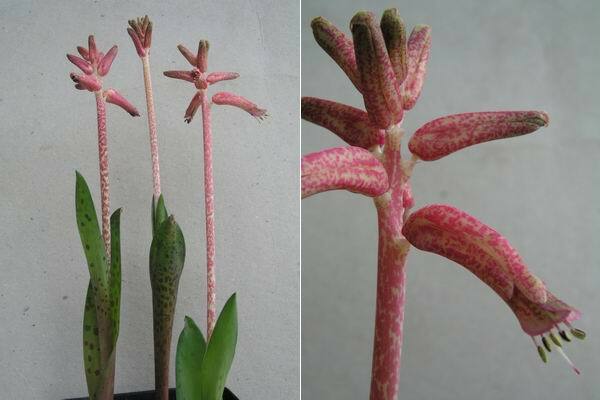 This is another flower in the same pot, the same clone, at a later stage of development. 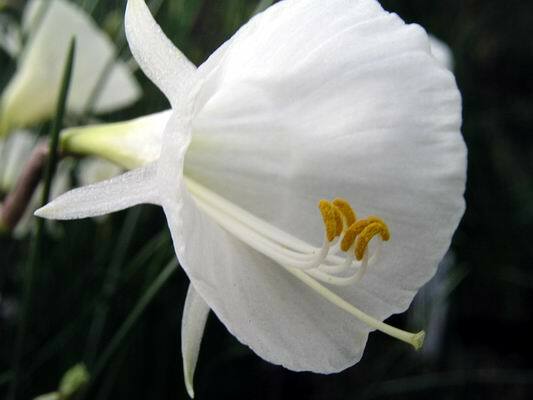 When the flowers first emerge they have a pale yellow colour which, after a few days, fades to white- they never get to the crystalline white of N. cantabricus. These pictures show how different a flower can look both when photographed from different angles and at different stages of development. 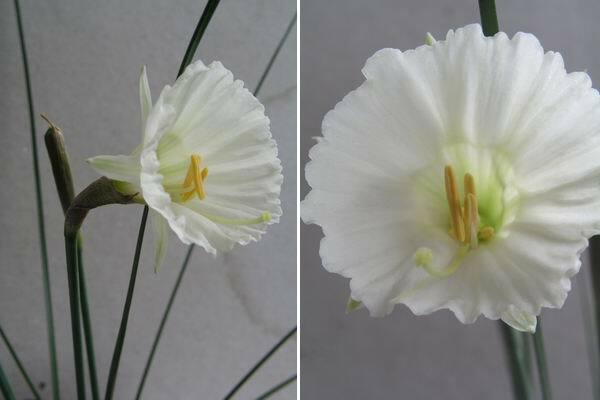 This is Narcissus cantabricus foliosus which has a different shape to the corona and is easily distinguished from N. romieuxii mesatlanticus; however, the more I look at them, the more I think that N. romieuxii mesatlanticus is a hybrid between N. romieuxii and N.cantabricus foliosus. 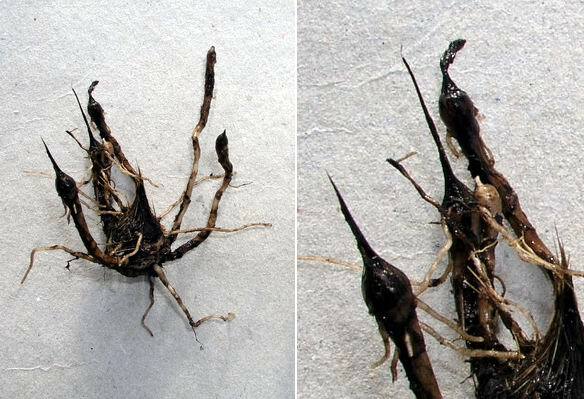 One of the distinguishing features of N.cantabricus foliosus is that it has a pedicel. 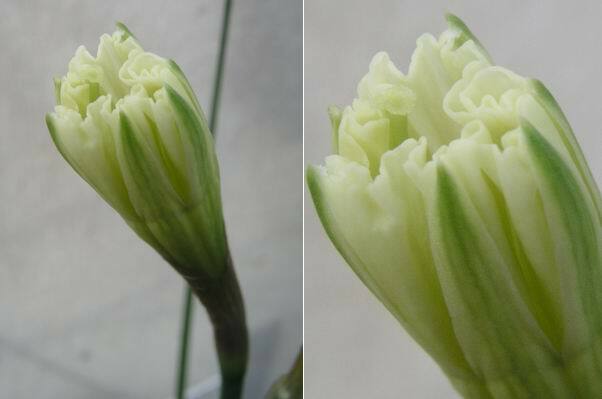 The pedicel is the short flower stem that sits on top of the main stem (scape) and is normally covered by the brown papery spathe - see between the lower two red dots on the left hand picture where I have folded the spathe back. On the right I have further sectioned the ovary and enlarged the section between the upper two red dots. This shows the style joining the top of the ovary, at the upper dot, and the pollen grows down from the stigma through the style to fertilise all the embryo seeds that are already formed and waiting. 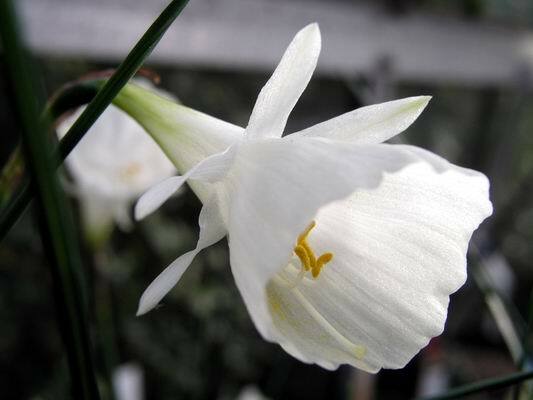 As we grow all these different but closely related Narcissus in one small glasshouse it should be no surprise that we get lots of cross breeding which results in lots of hybrids. We try to separate out good forms that are easy to grow, increase well, are free flowering and nice looking. The way that the flowers unfold from their buds is a wonder to me especially when you see the same flower a few days on. 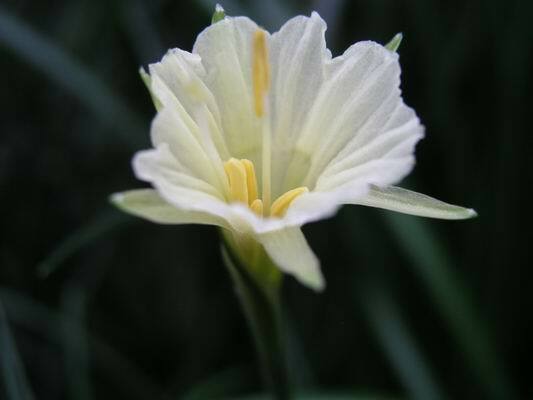 This seedling has a much frilled and almost white corona - it was one of the many that has self sown into the sand plunge and we have selected this one as having good potential. I think that it is almost certainly a seedling from N. romieuxii mesatlanticus. 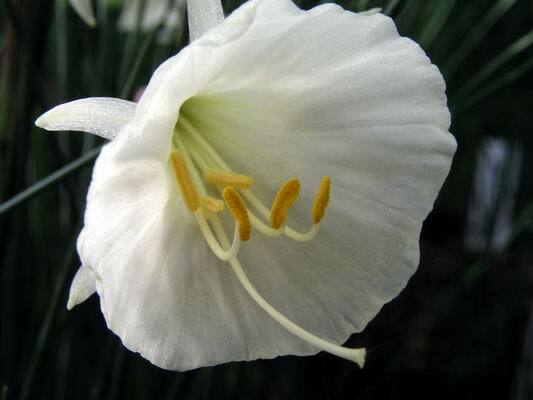 NARCISSUS, A Guide to Wild Daffodils, by John Blanchard. 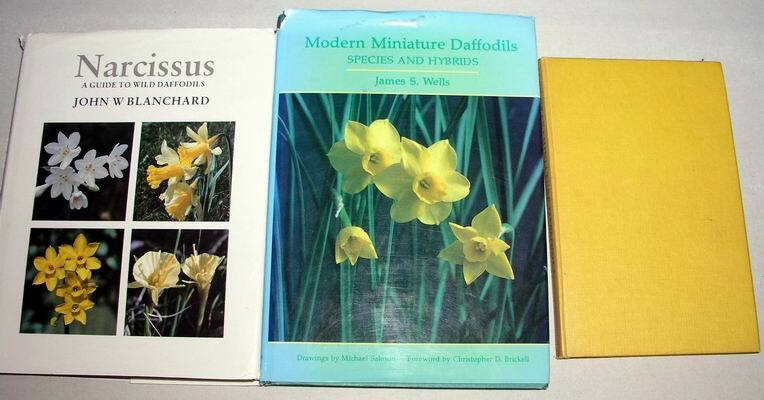 MODERN MINIATURE DAFFODILS, Species and Hybrids, by James S. Wells. These books replaced the difficult to find small volume Miniature Daffodils, by Alec Gray published in 1955.